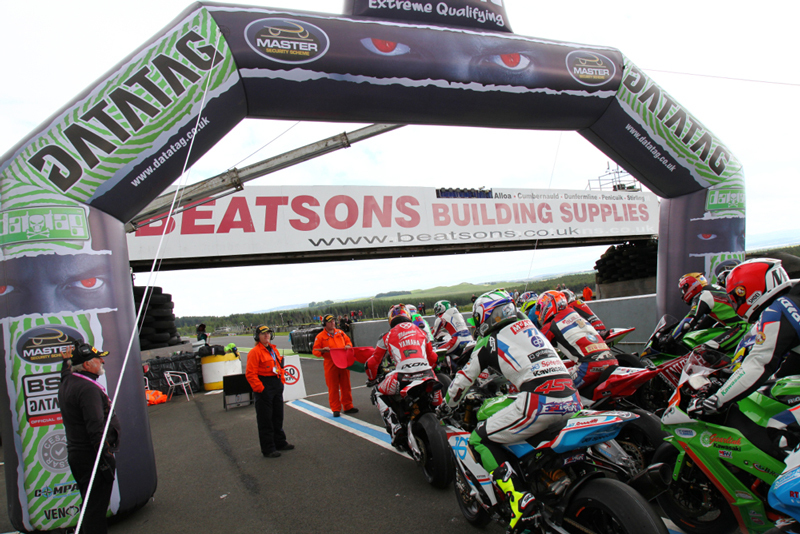 Shane 'Shakey' Byrne celebrated a Scottish double at Knockhill, holding off the challenges from his PBM Kawasaki team-mate Stuart Easton and hard-charging Josh Brookes in an 11-lap sprint race ahead of the next round of the season at his home circuit of Brands Hatch. 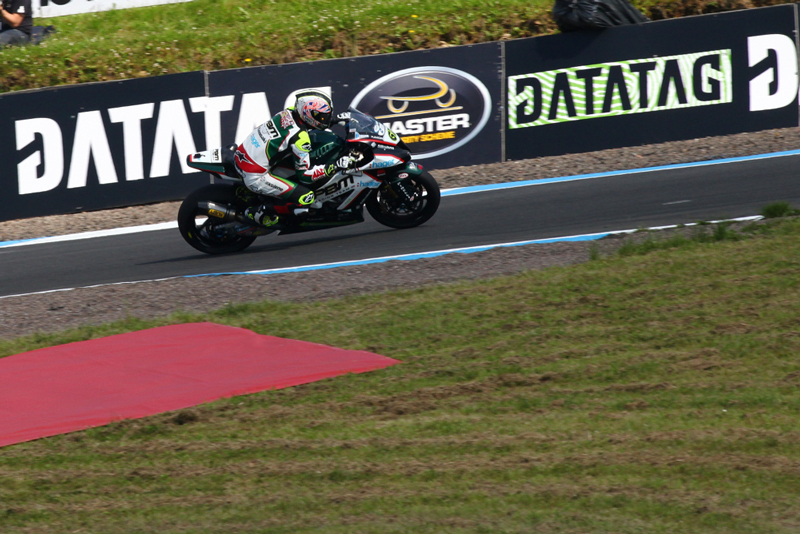 The race initially got underway with Michael Laverty leaping off the line to lead the pack into the first corner on the opening lap ahead of James Ellison, Easton, Byrne and Brookes. Ellison onboard the JG Speedfit Kawasaki was determined to make amends for his crash in race one and went for a move on Laverty at turn three, but ran wide and onto the grass which he managed to hold upright and rejoin further down the field. Laverty was still holding his position at the front of the field from Easton and Byrne as they took advantage of Ellison's mistake. However there was disappointment for the second Tyco BMW as Tommy Bridewell crashed out unhurt at turn three on the fifth lap. By the start of the ninth lap Byrne and Brookes had moved ahead of Easton after he ran wide at the Hairpin to then target Laverty for the lead. However the Scot wasn't prepared to hold station and he made a move again on Brookes at the Hairpin to move back to third on the twelfth lap. Byrne was trying to force Laverty into making a mistake, which he did at the Hairpin a few laps later, giving the defending champion the lead by the start of the 17th lap. 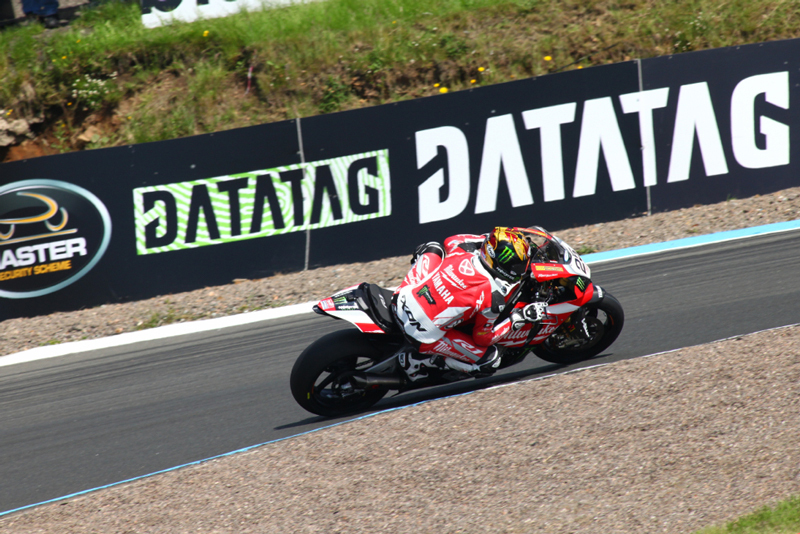 Byrne was holding off Laverty, Easton and Brookes but then the race was red flagged as rain began to fall. The passing shower was short lived though and after an interlude the race restarted in dry conditions and Byrne was focused on hitting the front and setting the pace. The PBM Kawasaki rider did just that ahead of Easton and Brookes who went on to complete the podium after the 11 lap sprint race. There was disappointment for Ellison on the restart as he was forced to retire his JG Speedfit Kawasaki, dropping a place in the standings in the process ahead of Brands Hatch. Luke Mossey had put in an impressive performance in his rookie season to be running fourth but the Quattro Plant Kawasaki rider crashed out on the penultimate lap at turn two unhurt. Mossey's crash elevated Ryuichi Kiyonari to fourth on the Buildbase BMW pushing him inside the top ten in the standings now as he held off Jason O'Halloran on the leading Honda Racing machine who completed the top five. 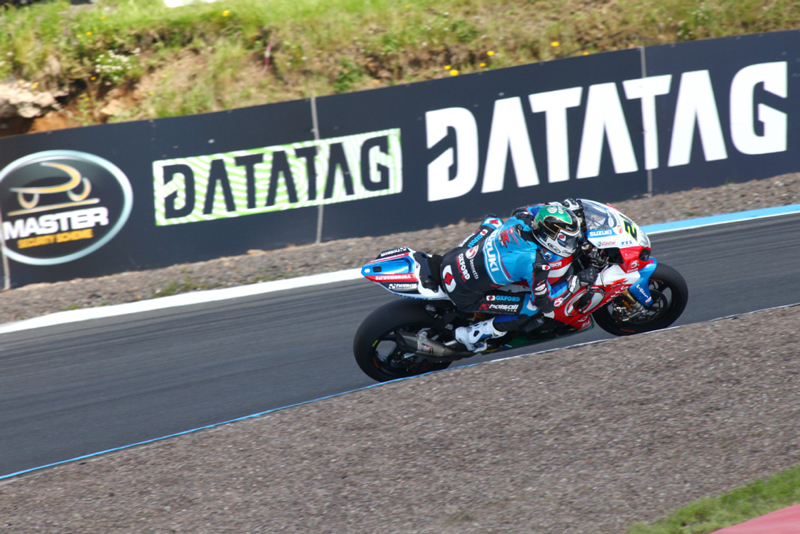 Laverty had dropped to sixth place in the closing stages of the race for Tyco BMW whilst James Westmoreland, Peter Hickman and Christian Iddon completed the top ten. 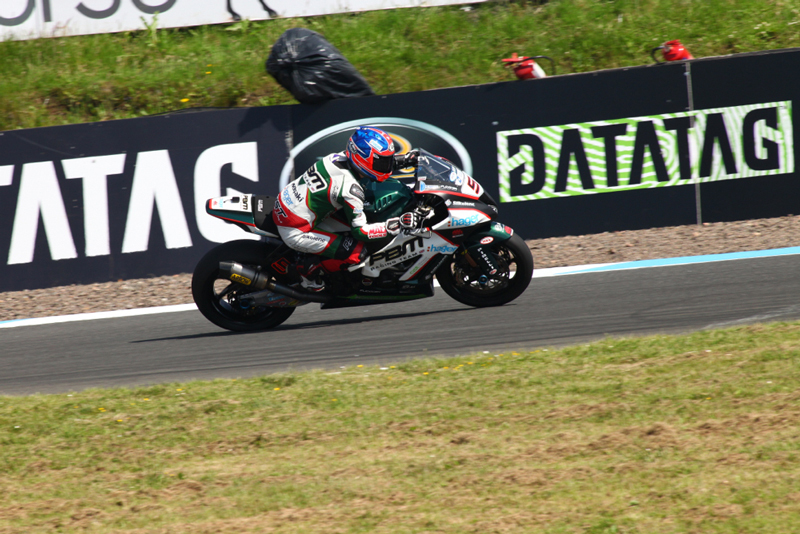 Shane 'Shakey' Byrne claimed a dramatic MCE Insurance British Superbike Championship pole position at Knockhill despite ended his Datatag Qualifying in the gravel after crashing out at turn seven in the final three minutes of the Q3 session. The top three contenders were lapping under the existing circuit record and Byrne was determined to put a bigger gap between himself and the chasing pack and as he exited turn seven he slid out of contention unhurt, but ended his session in the gravel. Byrne said: "I'm a little bit surprised with the outcome of qualifying. We all know what we think is an achievable lap time, and I planned for the time I thought I could do in that last session. I pushed hard, but it seemed like I was sliding on every single corner exit on the last run. I did a time that was good enough for pole, and a couple more close to it - but I think the rear tyre maybe wasn't up to the same quality as normal. "I thought 'oh ok, I'll run in a little hotter and be a bit more careful on the exit with the throttle,' but trying that on my second lap I went into Clarkes like normal, released the brakes a little earlier to try and carry a bit more speed, and tucked the front tyre. "It's frustrating for that to happen, but at the end of the day I'm happy with the result. It's PBM one-two, the times have been close; but I just thought we had maybe another two tenths or so there. "I think for tomorrow we've worked really hard on race pace. Yesterday afternoon, my best lap time - that would have got us fairly high up today's grid - came from the thirty third lap on the tyre. From that view, we should be cool - and with the times as close as they are, it should make for some pretty exciting racing! "In qualifying, it's always really difficult - and my aim every time is to just try and make it onto the front row. I'm not overly fussed about pole position, and even if that sounds crazy, I know that the main goal of the weekend is to work hard to be ready for the races. "The qualifying is incredibly close, but I think tomorrow four or five of us will be able to go off at the front and hopefully one of those will be able to go off a little bit further! There'll be come cool battles, because it's a track that lends itself to that." Stuart Easton starts second on the grid for his home round after overcoming Milwaukee Yamaha's Josh Brookes as the Australian holds third, despite leading earlier in the Q3 session. As Easton improved Honda Racing's Jason O'Halloran dropped back to the second row, after initially looking like he would hold on to a top three position. The Australian narrowly held off Ryuichi Kiyonari as the triple champion moved up the order throughout qualifying to push himself into fifth position with James Ellison completing the second row. 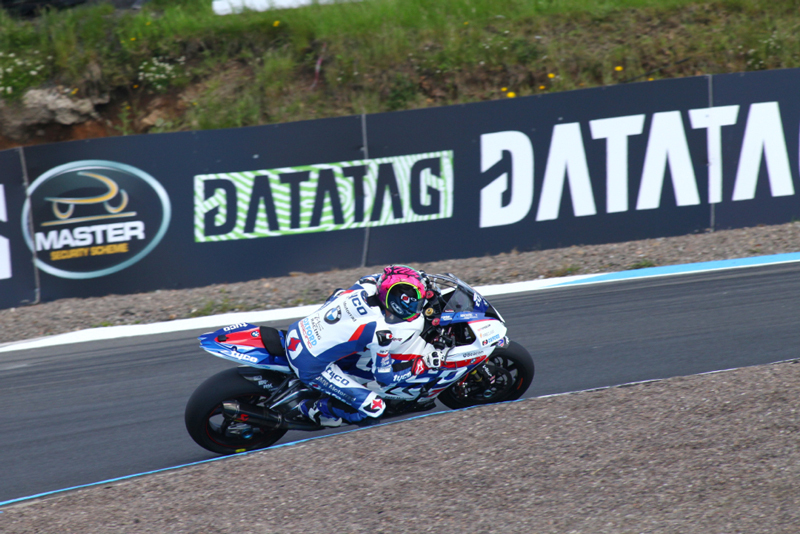 Tyco BMW's Michael Laverty got bumped down to seventh as Danny Buchan returned to the top ten ahead of Dan Linfoot and Luke Mossey as the frantic Q3 session saw the top ten riders covered by just 0.684s.